It may be hard to see how equal rights for women, national and global economic growth, infrastructure and water and sanitation can all directly affect each other but this is not an oversight suffered by the UN. With the range of topics on the agenda including everything from access to water to gender-based violence, CSW63 brings to light how the implementation of the Sustainable Development Goals (SDGs) revolves around a holistic view of sustainable development. The official 2018 SDG report found that overall progress on the SDGs is going well with many targets being met in time for the 2030 agenda. However, statistics on targets for gender equality and representation of marginalized groups show that these fields are underperforming. In a presentation regarding sustainable infrastructure, it was pointed out by Nick O’Regan, Director of Infrastructure and Project Management Group at United Nations Office for Project Services (UNOPS), that it will be “108 years until we reach gender equality is the latest prediction by the World Economic Forum”… Can we really afford to wait that long? This projection is problematic as linkages between SDG 5 to SDGs 6, 8, 11 and 16 make gender a common factor for the success of several other goals. 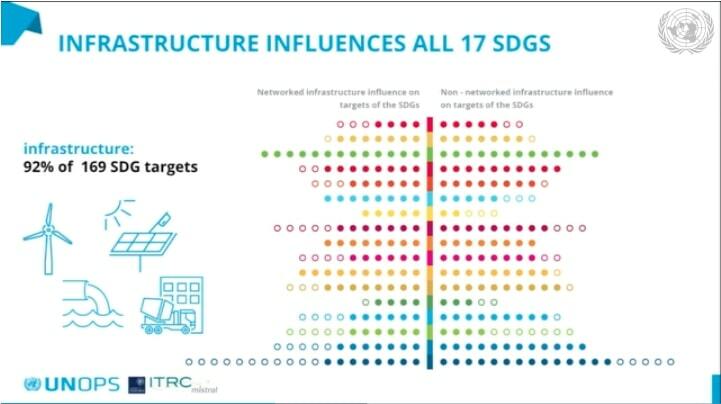 The way that infrastructure is designed can make a huge difference for the achievement of the SDGs. As the only UN office mandated in infrastructure, the UN Operation of Projects (UNOPs) is concerned with making infrastructure more inclusive. In one anecdote, Executive Director of UNOPs, Greta Faremo, spoke of how sexual and reproductive health cannot be fully realised when birth centres are not equipped with adequate resources and babies being born by iPhone light is a norm at birth clinics that lack basic functions. In this story, infrastructure (SDG 11) is linked to gender equality (SDG 5) and good health and well-being (SDG 3). Applying a gender perspective to infrastructure could remedy these kinds of omissions when it comes to allocating finances. Another example came from Estonia were public transit was made a free public service. It was found that this incentive was beneficial for both women, who are more likely to use public transit, and for the environment (SDG12) as it made alternative methods of transportation more accessible and focused on innovative ways to reduce emissions. In most countries where water is not readily available in the household, women are tasked with the role of water collection for household usage. It was noted that while men are more inclined to use water for profit, such as on cash crops or livestock, women are more likely to use water for domestic purposes. Even a natural resource, such as water (SDG 6), is not free from a gendered perspective when looking at who uses it and why. Furthermore, in terms of sanitation, women require gender specific infrastructure and services for sanitary needs (SDGs 5, 6 and 11). In an example of a program run by Women Engage for a Common Future (WECF), business skills management is provided to women in local communities so that they can manage water kiosks and water management centres. This training is provided to women with the understanding that they can more efficiently budget water based on their knowledge of water consumption for domestic needs. This shows how efforts to achieve the sustainable use of water (SDG 6), by bringing women into the management process (SDG 5), are enhanced through education (SDG 4) and decent work (SDG 8), producing better results. These are just three out of many instances put forward at CSW63 of how gender crosses into other fields. Viewing the SDGs holistically is not just an ideological aspiration but also an important factor for their success. It is important to reflect on the progress thus far, but the focus should remain on targets and projections that are not being met. As the implementation of the SDGs is in its early stages, it is important to keep in mind their key mandate, which is sustainable development for ALL. The success of the SDGs will not be measured in meeting the most targets but rather in the fact that the benefits can be enjoyed by all people, across all spectrums and most importantly ensuring that no one is to be left behind. To be sustainable, development must first be inclusive.